Apps for Ag – Farmers are using them every minute! Apps, we all use them. Short for “application software,” they didn’t even exist until recently! However, now some of these quick hit apps are the first thing we look at in the morning and last thing at night (and multiple times during the day). Just as apps have become essential in our day to day lives, they are now helping farmers make decisions that allow them to grow our food more efficiently at the same low cost to consumers. They have become so commonplace that there are now services such as Agriculture.com that provide rankings of the top apps to assist farmers in choosing between them. 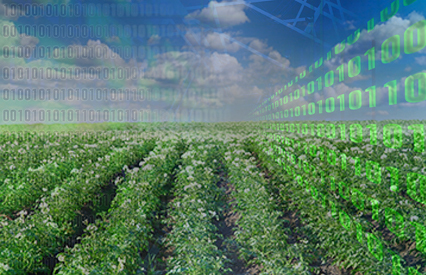 This is not surprising as the trend for greater and greater reliance on huge data-bases of information and new technologies become an essential part of modern agriculture. Farmers now use their hand-held devises for many things, including checking weather, turning on or off irrigation equipment, maintaining pest counts from field scouting, identifying bugs, checking field records, reviewing soil types, ensuring site-specific planting or production, keeping track of pest control operations, or just recording interesting facts that may be of use for long-term field management. These tools often link directly back to computers in farm offices and allow farmers to maintain a complete record of everything that happens on the farm throughout the year and make critical long-term comparisons at the farm level. This not only helps improve production but is also essential to meet the many processor, retailer and public agency reporting criteria that are required nowadays to keep our food supply safe. To maintain its integrity and provide unbiased information to farmers, app development is increasingly happening in the public sector. The University of Wisconsin has now launched an inter-disciplinary program designed to develop timely, locally driven, needs-based mobile apps. 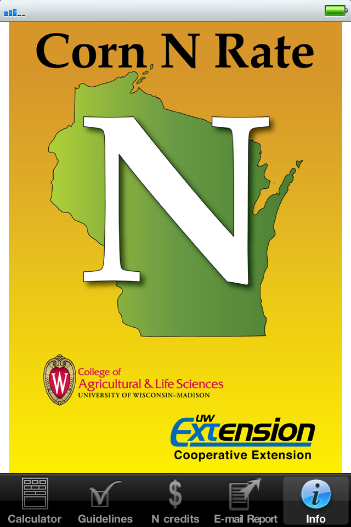 Working with UW-Extension agricultural specialists and outreach program managers at the CALS Nutrient and Pest Management Program (Department of Horticulture), app development is occurring to meet many Wisconsin based needs. 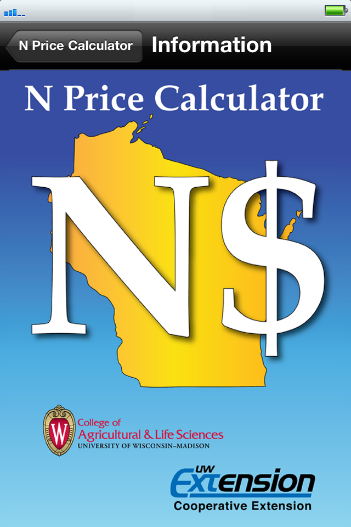 Wisconsin’s Corn Nitrogen Rate Calculator – designed to assist producers in selecting nitrogen fertilizer rates to maintain profitability in the face of fluctuating nitrogen and corn prices. 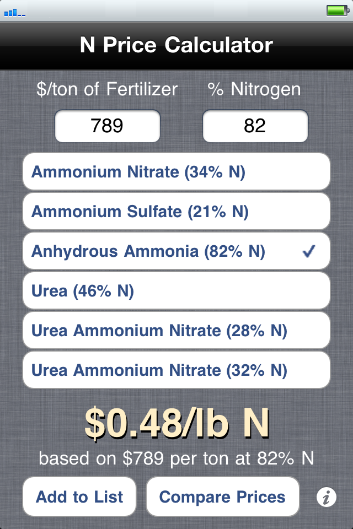 Nitrogen Price Calculator – which helps convert the price of each commercial fertilizer product from price per ton to price per pound of the key active ingredient, nitrogen — allowing for “apples to apples” comparisons helping growers make economic decisions and follow research-based recommendations. IPM Toolkit – helps growers make the day-to-day pest management decisions by providing up to date articles, videos and research based publications from a single source. Growers can quickly review a large selection of relevant information and pictures to diagnose specific problems in their fields and look for research-based best management practices to address them. Crop Calculators – lets corn growers calculate corn grain yields, corn maturity dates in relation to predicted frost, and corn silage price adjustments in relation to moisture content which helps them determine when it is time for harvest. 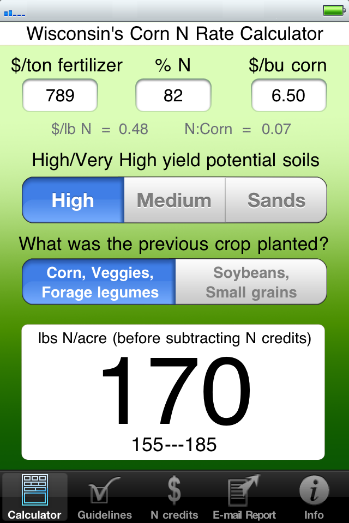 Manure and Legume Fertility Credit Calculator – helping farmers save money and protect the environment by taking credit for the fertilizer value of manure and legume crops and using less in season fertilizer. Many more apps are being developed and used by farmers to allow them to balance productivity, profitability and environmental impacts on the farm. This trend for using mobile technology to improve decision making in agriculture will continue increasing as the worlds need for food expands and farming becomes more competitive. The key is to ensure that the apps are up to date, provide science and researched-based information, and contain reliable, non-biased data and recommendations. Having this information in the palm of your hand, in your pickup and in the tractor cab has become as essential to modern farming as the accumulated experience of our grandfathers and fathers that drove agriculture in past times.